All over the world they are disappearing. Hives are empty, not even a dead bee to be found. Invader species refuse to take up residence in the old hives. No one seems to know why the bees are disappearing. 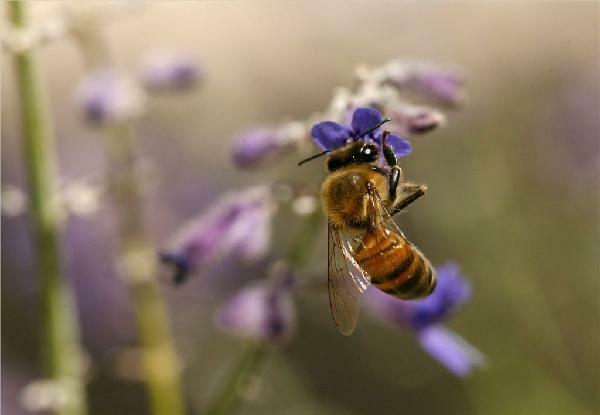 What we do know is that 60% - 70% of all honeybee colonies are vacant. We realize that without honeybees the crops of fruits, nuts, corn etc do not become sufficiently pollinated to allow them to bear fruit. Read more, please: Linda Moulton Howe's EARTHFILES. In the past we have called for such action when areas of the world were experiencing unbroken drought. People from all over the world joined together in giving Appreciation for Precipitation. As the Weather Spirits received this outpouring of love and gratitude they responded with a giving forth of rain! It is now time to hold the honeybees in appreciation, to allow our pouring forth of gratitude to revivify and embrace back into the fold of life and sustainability our dear companions upon this planet: Honeybees! Shaman Jade Wah'oo Grigori says, "In whatever manner you are personally able, move your awareness into that of appreciation. Perhaps meditate upon someone for whom you have appreciation and gratitude, an event that stimulates a sense of deep gratitude. When this is a felt-sense, a palpable experience within your body, disengage the object of your appreciation (the person or event) so that you remain in a non-attached state of appreciation. Draw into this state the image of honeybees. Now bring in an association of how they sound, their buzzing about, their beauty and grace, the wonders of honey as a food and as a wonderful sweetener of life! Feel that joy rushing through your body as you contemplate the honeybee. Hold your awareness of Honeybees in this state of appreciation. Do so for as long as is 'right' for you. When you are ready to stop, forcefully blow your breath into the image of the honeybee. This breath of life, sent in appreciation carries with it all your desire for blessing and positive life empowerment to be carried forth to the honeybee species." If you feel called to do so, please gather in groups in your area and participate. Please send this to others. Together we can show our gratitude and together we are magnanimously powerful.